Most Greek Byzantinists, scientifically acting within or outside Greece, supported the institution of the Byzantinists' Conferences of Greece and Cyprus, where seven conferences were organized from 1998 to 2007. 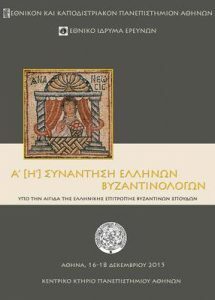 Considering that this institution was successful and contributed to the promotion of Byzantine Studies in Greece as well as to their international visibility, the Greek Committee for Byzantine Studies undertook in 2014 the initiative to revive the Meetings as a follow-up to the original institution but in a new form. The conferences now bear the name Greek Byzantinists' Conferences and continue to have as their main objective the acquaintance of older and younger scientists. They are organized every two years by Greek university institutes, in possible collaboration with recognized research institutes. The Greek Committee for Byzantine Studies bears the responsibility of searching the commission of the meetings, whose representatives will cooperate with the Organizing Committee during the preparation of the Conference. 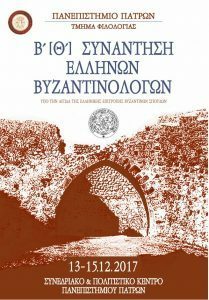 The Department of History and Archeology, Philology, Music Studies and the Department of Theory and History of Law of the National and Kapodistrian University of Athens, in collaboration with the Institute of Historical Research of the National Hellenic Research Foundation, are organizing the 1st [8th] Greek Byzantinists’ Conference in Athens, from 16 to 18 December 2015. The proceedings of the conference will be held at the University's main building, 30, Panepistimiou Str. The Department of Greek Literature of Patras University is organizing the 2nd [9th] Greek Byzantinists’ Conference to be held at the University of Patras in December 2017, from Wednesday 13th of December afternoon to Friday 15th of December night. Note! You can see the abstracts of the announcements by opening the above program of the meeting and clicking on the speaker's name or the title of the announcement.